The award was presented to the Railway by Her Majesty’s Lord-Llieutenent for Staffordshire, Mr. Ian Dudson CBE Cst. After the presentation there followed a train ride to Chasewater Heaths for the presentation of a replica crystal and scroll to the staff from the station. On return to Brownhills West, an excellent buffet was on offer, which was enjoyed by everyone. Congratulations to the catering staff. Following a tour of the buildings, including the Museum, the Lord-Lieutenant departed. 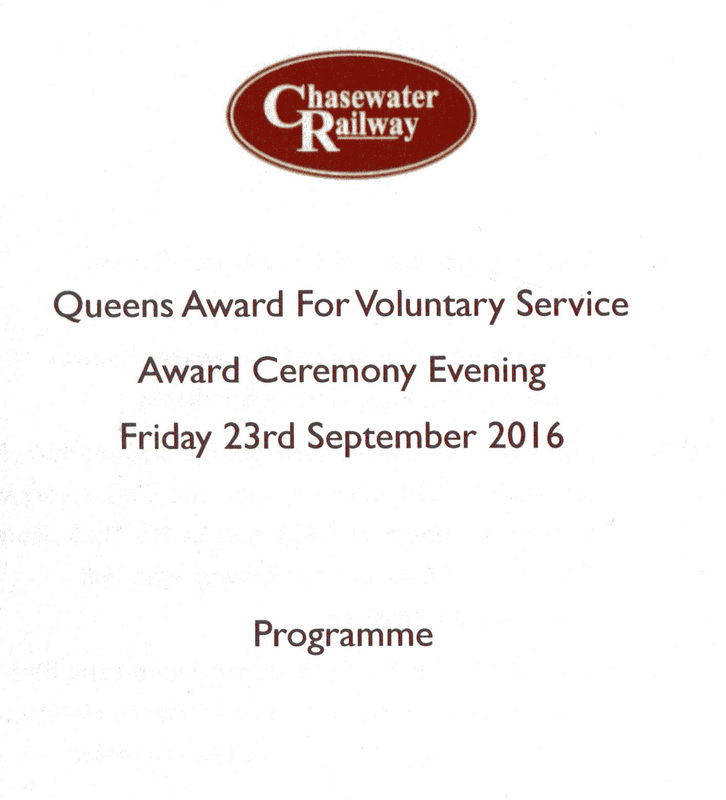 At the conclusion of the evening, Mark Sealey, Chairman of the Railway, presented all working volunteers with a commemorative QAVS badge. This entry was posted in Events, News and tagged Aldridge, Bloxwich, Burntwood, Cannock, Cannock Wood, Chasewater Railway, Chasewater Railway Museum, Hazel Slade, Heath Hayes, Lichfield, Norton Canes, Pelsall, Queens Award for Voluntary Service, Staffordshire, Walsall, Walsall Wood, Wolverhampton. Bookmark the permalink.